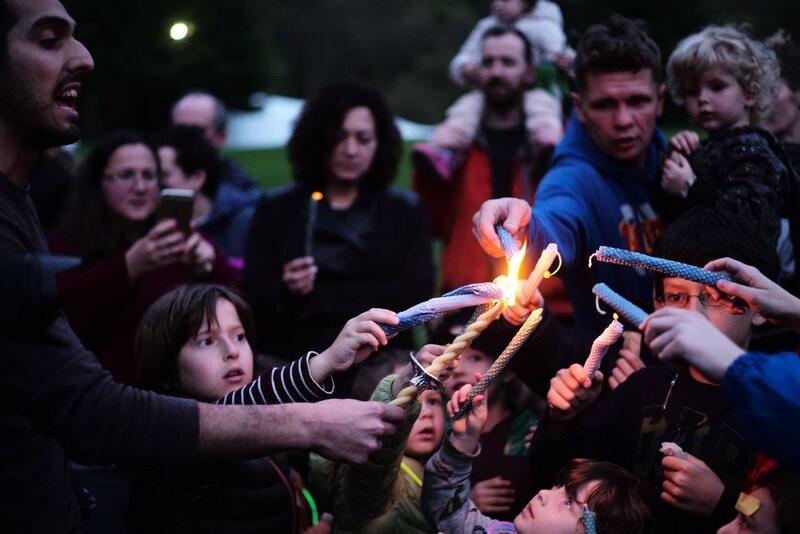 More than 150 people joined together for the Marks JCH Kibbutznik Shabbaton held over Mothers’ Day weekend at Club Getaway in Kent, Connecticut. Russian-speaking Jewish families with children ranging in age from just a few weeks old through age 12 enjoyed three days of escape from the city, fresh mountain air, and sophisticated, experiential, multi-generational Jewish education. The theme of the weekend was “The Architecture of our Jewish Tomorrow,” and the educational program focused on teaching and exploring the building blocks of the future of the Russian-speaking Jewish community. With a fabulous team of educators, including Yuliya Patrakova, a well-known Russian-speaking Jewish educator from Saint Petersburg, who spent a week following family camp at the “J” as an “Artist in Residence,” and Vilna native Inna Barmash, a well-known Yiddish singer, sessions included Tot Shabbat Musicali, costume making and theatrical performances, adults studying the History of 20th Century Jewish Architecture, Raising a Mensch, and Prayer for Non-believers with our own Melanie Levav. Also included in the programming was a hands-on boxing workshop with WBA Welterweight Champion Yuri Foreman and chess simul with Elina Cotler. Among our first-time family camp attendees were the Yermash family, parents Eugene and Tanya who met as camp counselors at the “J” when they were in their teens. They are now in their early 30s, both working on Wall Street, living in Park Slope, parents of a 2.5yo daughter. Eugene and Tanya are the quintessential example of the Kibbutznik families we are privileged to serve. They were both born in the former Soviet Union, were raised in Bensonhurst and Brighton Beach, where the “J” was their second home after school, on Sundays, and each summer. They are now seeking to create community with families of similar backgrounds. Kibbutznik provides likeminded families with a safe space in which to create the new kind of Jewish community and affiliation these millennial and Gen X parents need to find meaning in their lives as American Jews. The Kibbutznik Shabbaton was the culminating event in an exciting year of growth in Marks JCH’s work with young Russian-speaking families in Park Slope and Brownstone Brooklyn. Twice a week, our Mommy and Me met at the Brooklyn Society for Ethical Culture across from Prospect Park, celebrating Tot Shabbat each Friday, and every month, we offered innovative Jewish holiday and cultural celebrations, through high level, hands-on arts and culture studios, helping parents to access Jewish life and learning. We are grateful to our partners, most especially our funder, the Genesis Philanthropy Group, for their trust in the Marks JCH, as well as the Hannah Senesh Community Day School, for our growing partnership in Sunday community-wide programming and renting their beautiful classrooms in Carroll Gardens to host our Kibbutznik Russian-language immersion summer day camp.